a recoil device R for stopping the pusher cylinder after it has passed through the gun. In practice, the projectile containing the roll of light cord is fitted into the end of the long pusher cylinder. The projectile is then placed in the lower end of the gun. When power is applied, the projectile and pusher cylinder are thrust upward at an angle of forty-five degrees. As the pusher cylinder is purposely made quite long, the thrust of the electric gun acts upon it for a period of time sufficient to impart the requisite amount of kinetic energy to the projectile. 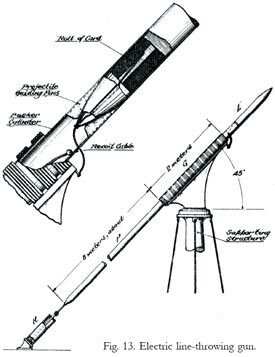 By allowing enough time for acceleration, the electric gun can produce great velocities without requiring unreasonable generator capacity, After the thrust has carried the entire pusher cylinder through the gun, a knot on a steel cable passing through the cylinder brings it to a stop. The shock of stopping the cylinder can be absorbed by a recoil device on the deck or ground. By the use of a net, the cylinder can be caught and so used again. The projectile, because of its speed and inertia, leaves the end of the arrested cylinder and starts on its arrow-like flight. The cord coiled within the body of the projectile is paid out behind it through a smooth hole in the tail. The gun is aimed horizontally by rotating it around a vertical axis on its supporting structure. The range is adjusted simply by varying the voltage applied to the terminals of the gun coils, the gun being normally elevated at a fixed angle of forty-five degrees with the horizontal. It is estimated that a twenty-five kilowatt generator could be overloaded sufficiently to deliver the power necessary to shoot a line-carrying projectile to a distance of five hundred meters. As the over-load would not be carried for more than one second, there would be no danger of overheating the machine.